Seattle Boat has been providing a full range of marine services for over 30 years, helping Western Washington boaters enjoy the spectacular waters of Lake Washington, Lake Union & the Puget Sound. We are passionate about your boating experience both on and off the water. 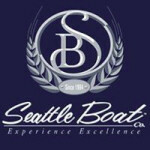 Seattle Boat Company offers a wide range of services to help you with all of your boating needs. Located at Newport yacht basin, Extremely expensive, be carful when seeking parts and service. There fuel dock sells Fuel that has ethanol in it.